I've got another before and after for you. One of my favorite clients came back to me again to do makeup for her wedding reception in LA. Fortunately I was in town that weekend for PhamExpo so she was the perfect person to be the model for my makeup demo. We went for another glam red lip look. Check it out! 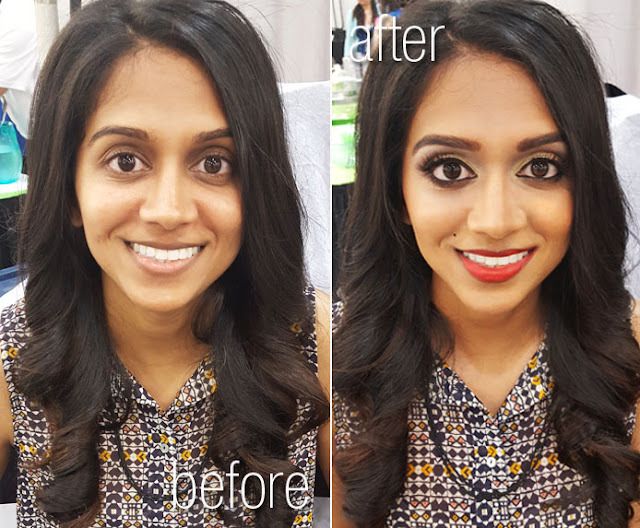 I had already done my client's Atlanta Wedding Makeup. She had just moved to LA and was having another wedding reception for her husband's family and friends. 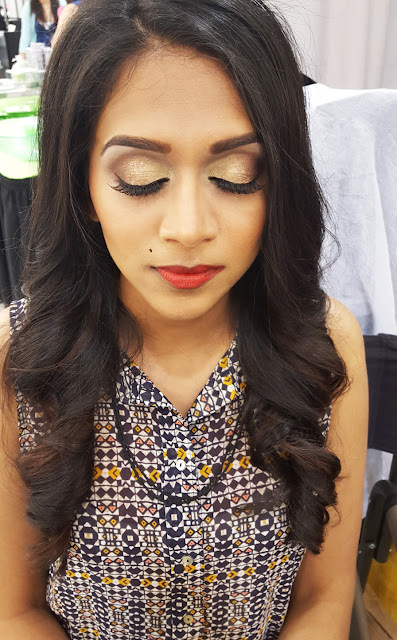 The first time around we did a traditional Indian Wedding Makeup - Arabic style eyes and ruby lips. This time around I wanted to do something a bit more modern. On the eyes I used a gold base and then I applied a copper glitter by dotting on small specks using a liquid glitter liner - this is a great tip for getting the glitter effect without fall out. I also smoked out the eyes using a bronze and dark brown instead of a matte black so it wasn't as harsh. I lined with my favorite Inglot Gel #77 liner. We used Ardell Demi Wispies to finish off the look. On her skin I used a custom mix of Makeup Forever HD Foundations. The lips are Alcone Enduring Lip Color in Cherry Pie - my go to red for clients who have receptions and are in need of a long lasting lip color.